The known* armbands from 1909-1947 are made of either felt or a silk/satin type material. Because these two materials were used they tend to suffer damage, mainly from insects with felt armbands and general frailty with silk/satin armbands. 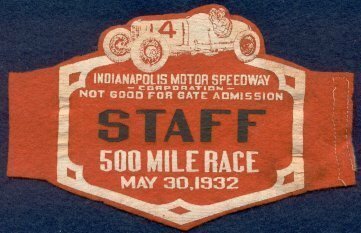 The only *known IMS armbands after World War II are the 1946 Staff and 1947 Safety Patrol. 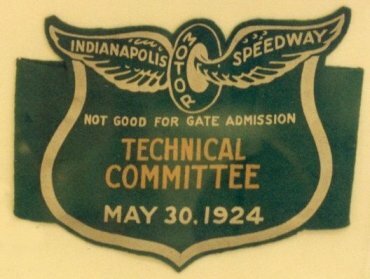 All *other IMS armbands are medical or winning car photographer after WWII. 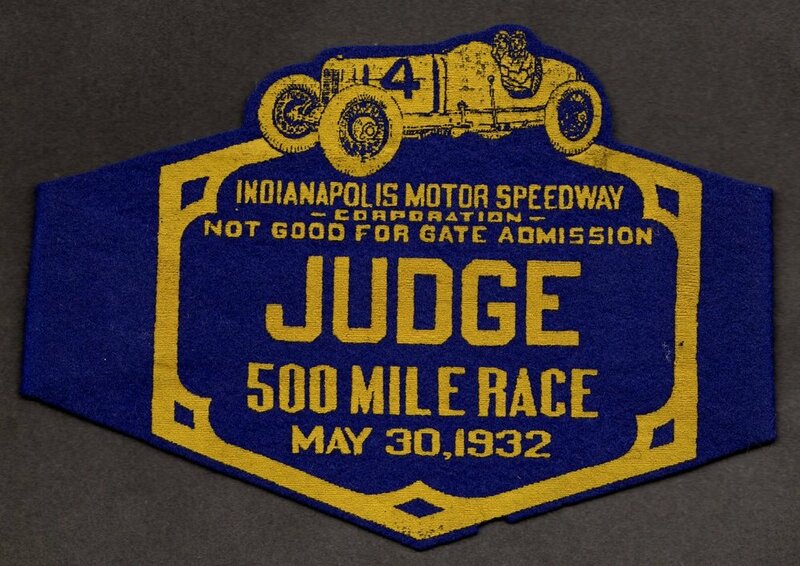 We need pictures of IMS armbands from the years not shown and any pictures of other armbands from those years already shown. If you have any, please email ni500cc@ni500cc.com a scan so it can be posted here on the site. 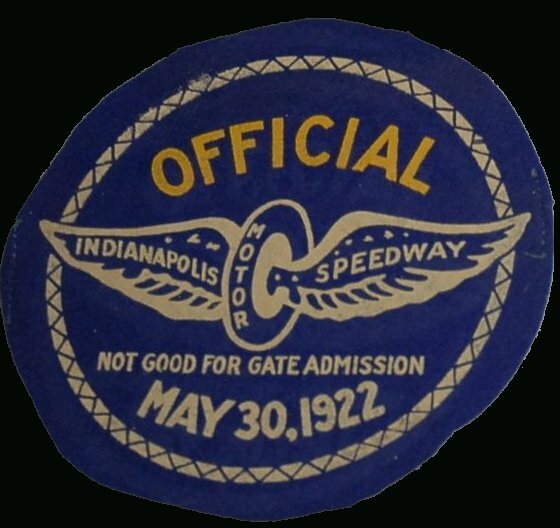 Although it is not indicated as being from the Indianapolis Motor Speedway, the armband below is believed to be from the balloon race of June 5th, 1909. Due to the very cold weather, the December 17th and 18th 1909 Record Trials (sometimes referred to as the “brick test” were not well attended with only 500 people estimated to have attended. 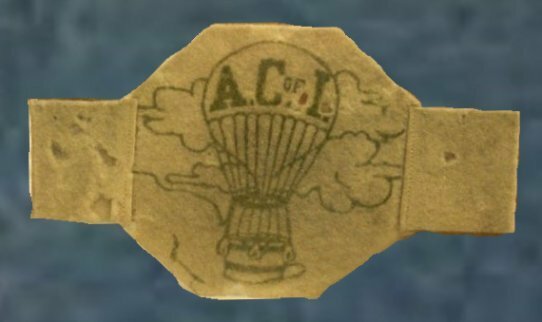 Below is an "Official" armband from the event which is extremely rare and may be unique. 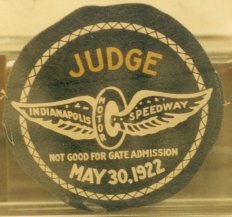 A silk "Timer" armband from the Sept. 9th, 1916 Harvest Classic Auto Races. It is so fragile that any further handling will only damage it further so it will forever be kept protected in an acid free plastic holder. 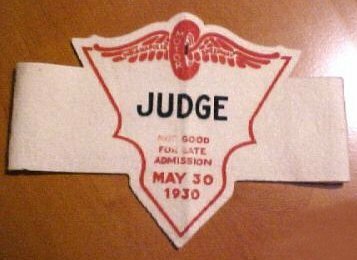 There are at least four known* colors for Judge armbands. Why this was done is uncertain. 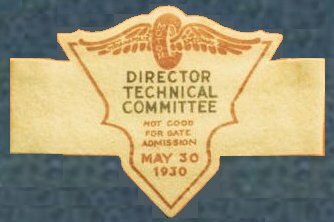 Note the Time Trial armband below and those from 1935, 1936 and 1937. They are made from a cloth/canvas type material and use tie strings to secure to ones arm. Because of the fragile nature of felt and silk/satin armbands, many did not survive making most of them very rare, very tough to find and very desirable. Those from the mid-late 30's do become easier to find, but are by no means easy to find.